Why Hire an SEO Consultant? Your website serves as the main marketing and communications hub for your organization. It’s a key component for convincing potential customers to engage further and do business with you. For many websites, the visitor traffic driven by organic search engine activity is simply the highest quality ‘non-direct’ traffic they receive. We can easily see this in web analytics, e.g., Google Analytics reporting for the site. Organic traffic from Google and other search engines often beats other traffic sources in terms of website engagement factors, including conversion metrics such as email signups, contact forms submitted, and telephone inquiries. SEO often beats pay-per-click (PPC) ads, social media marketing, email marketing, and other digital advertising channels for overall marketing ROI. SEO is also an integral part of establishing your firm as an authority on your most important topics. SEO marketing can build your website traffic, authority, lead flow, and revenues. A good SEO consulting resource can be a huge help. As a Michigan SEO consultant based in Ann Arbor, I provide a range of SEO consulting services outlined below. If you’re looking for a Michigan or metro Detroit SEO consultant or small agency, iBeam may be a great fit for you. I use powerful tools, including Google Search Console, Bing Webmaster Tools, and other professional SEO software to analyze the overall health of websites and their status in the eyes of search engines. iBeam website audits include important factors such as mobile usability and page loading speeds. I perform SEO audits of websites to uncover important issues that hurt search engine rankings. This includes website structure and many other technical factors that impact SEO. This includes analyzing specific website content (pages or posts) for potential SEO improvements. I’ll look at target keyword combinations to determine how your pages perform against specific searches. This keyword research also often reveals new opportunities for keywords that drive decent search volumes but still have lower search competition. I’ll also look closely at your content structure, quality, and readability… making content improvements where needed, as described further below. The number and quality of your website’s backlinks (incoming links from other web properties) are important for SEO purposes. They help search engines score the quality and authority of your website content, and are therefore important ranking factors for SEO. I use tools to build a backlink profile and assess the quality of those incoming links. This analysis may even find some low-quality backlinks that should either be removed or disavowed. 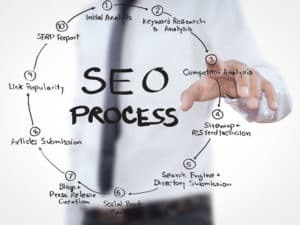 It’s also possible to analyze backlinks for your key competitors to assess where you stand vs. competition and where you may be able to gain some relatively easy backlinks. WordPress is the world’s most popular content management system (CMS) and has good SEO features when configured properly. There are also good SEO plugins to make WordPress SEO even easier. First among these is the Yoast SEO plugin. I use Yoast and recommend it for clients’ WordPress websites. I will help you configure your WordPress + Yoast environment for SEO performance. This includes using the plugin’s features on a per-page and per-post level for immediate on-page SEO improvements. In-house marketing resources are often fairly good at writing new content… when they have the time to get to it. They may even have agency or freelance writers helping them. But what’s often missed is the opportunity to write with *both* the human reader and search engine optimization performance in mind. Fortunately, it’s possible to do both without sacrificing readability or resorting to gimmicks. That’s where iBeam can help. I’ll review your existing content and then improve it for SEO performance. And I’ll do this with a light touch, never forgetting that the human reader, not a search engine robot, is always our most important audience. SEO consulting and content development truly go hand-in-hand. iBeam’s SEO content planning services help clients strategize and develop entirely new content that impresses customers and prospects while also boosting organic search rankings and incoming traffic. From website pages, articles, and blog posts, to white papers, case studies, and e-books, I can help you develop and promote new, high-value content that improves your search engine rankings and domain authority. Having high-quality content on your website is the base requirement for earning links from other high-quality and high-authority websites. As mentioned above, building an impressive backlink profile over time is the essential part of search engine optimization known as ‘off-page’ SEO. I’ll use professional SEO tools to assess your website’s current backlink profile and identify quality targets for backlink requests and placements. With time and effort, off-page SEO will complement on-page SEO content improvements and boost your overall visibility in organic search results. As part of link-building research and outreach, we can also look for legitimate industry media sites that may be interested in publishing or referencing your content. Placements within high authority 3rd-party sites give you exposure to an expanded audience and build your brand and inbound website traffic. They can also result in high-quality backlinks that further help your backlink profile and SEO. Social media marketing can also play an important role here by exposing your content and brand to a wide audience, earning you further recognition by high-authority influencers. I don’t use short-term SEO tricks and gimmicks (known as ‘Black Hat’ SEO tactics) that can result in short-term search ranking improvements but then backfire, causing dramatic website visibility (ranking) problems due to Google penalties and search algorithm updates. iBeam SEO consulting is all about using legitimate, White Hat SEO techniques and tactics to help drive more online traffic to your website. If you’re looking for a Michigan SEO consultant based in southeast Michigan, including Ann Arbor and Metro Detroit, let’s meet over coffee or other suitable beverage to discuss your project. If we’re further apart, no problem at all. Let’s connect via email, phone, Skype, or other web conferencing tool to start the conversation. This post shows how to conduct an SEO audit using Google Search Console, a powerful free tool available to everyone. Google offers a tremendous range of free tools for SEO. This post introduces over a dozen of them, plus extras. Learn about SEO content planning based on keyword research. This post explains some of the tools and processes. Learn how to do a good basic audit of a Google Analytics setup here. A top-to-bottom review for a live website. B2B website owners always want to know who is visiting their site. This post explains some of the ways we can learn this. Looking for a Michigan-based marketing partner? This post goes into detail about marketing resources in Michigan.